In elementary school, I was driven to materialize my imaginations with whatever vehicle available – paint, play dough, Popsicle sticks, Paper Mache. Though my mind’s eye twitched and ignited, I couldn’t manage shifting out of park. Like a dyslexic seeing-eye dog, my hands led me in all sorts of erratic, fumbling directions creating poor imitations rather than true reflections of what I envisioned. In my senior year art class I finally accepted this truth. Holding up a piece of my “abstract art” – a color-bleeding butterfly – I winced. Like this ugly, watered-down version of a butterfly, so were my artistic talents. Letting go of my paintbrush, I set aside my artistic dreams. What was it that kept fueling this creative passion while my art choked on empty fumes? I think it was the hope of improvement. Yet, more than hope, I envisioned a desired outcome – saw beyond the artwork’s present form and reality to what it could be. Now, that’s how I see people. In a StrengthsFinder test, I discovered that I am a “Developer” – someone who sees, recognizes and cultivates the potential in others. This StrengthsFinder test/book gives the reality check that “you cannot be anything you want to be – but you can be a lot more of who you already are.” Instead of operating out of my weaknesses, I found the value of developing and living out of my strengths. This shift resurrected my desire to express what I saw. God showed me that I am an “artist who sees” three ways: seeing potential in others, being a dreamer, and using words to give birth to the pictures in my head. I realized I still possessed God’s creative gift – I just had to find a different vehicle. Are you tired of hitting road blocks? Don’t give up on the journey. Ask the Lord to help you see yourself from His perspective. Discovering your God given strengths and releasing your frustrations will help you drive your passions forward. Our downstairs reeked of sweaty boys, Mountain Dew, pizza, and Doritos from their all-night LAN party–the male version of a slumber party where they eat, belch, pass gas, laugh, cheer, scream, and play online computer games until dawn. Our dining room looked like NASA’s control room, (thanks to my techie husband), where testosterone-driven boys, connected by power cords and flashing screens, fixed their eyes on other-world action and threw themselves into the game. Believe it or not, the last rule was the hardest for them to follow. 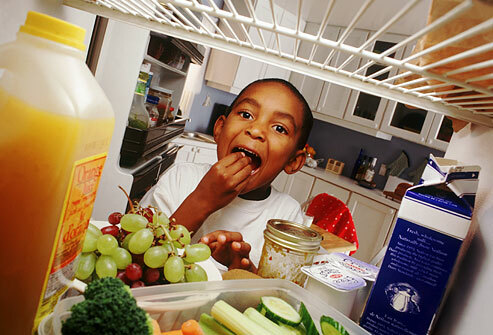 To some, refrigerator rites were almost as personal as snooping through someones dresser drawers; you just didn’t rummage around another person’s refrigerator and help yourself to their food. But, this rite served two purposes in our home, and we enforced it: First, it relieved me from hostess duty. Second, and most important, it made the boys feel comfortable, like they were at home. God offers us refrigerator rites, too. He adopts us as his own children (purchased by the blood of Jesus) and says, “You’re part of the family. What’s mine is yours. Help yourselves.” But how many of us shy away, feel like we’re eating a piece of forbidden fruit if we take anything from God’s refrigerator? Maybe growing up without a daddy makes it awkward at first? We might need more time growing comfortable sharing the same bag of chips before we help ourselves to the last bagel without asking. One morning after seven years of all-night LAN parties, I found a dollar and a note pinned to my ‘frig. It read, “Dear Mrs. Aaron’s Mom, Sorry, I ate your last bagel. Here’s a dollar. Ben.” I chuckled and gave him back the dollar. Maybe we’re like Ben, uncomfortable taking something from God without offering payment, knowing the value of what God’s offering. Help us to simply accept our place in your family through the blood of your Son, Jesus. May we learn that there is no other payment necessary to find a place around your table. Help us to spend more time with you so until sitting in your presence feels like home–enough like home that we can help ourselves to anything in your refrigerator. Amen. Celebration is a lifestyle and a form of worship. It’s not just something to wait to do for birthdays, holidays, marriages and graduations. Because God desires our worship, every day we have many opportunities to rejoice in what God is doing and how He is moving. I love the song “You are Good” by Brian Johnson and Jeremy Riddle where it says“In the sun or rain my life celebrates, You are good, You are good!” No matter what the day brings or what season you are in, focusing on the goodness of God is vital. Nehemiah 8:10 says “ the joy of the Lord is your strength.” By remaining in joy and constant worship of God , you have the strength to face anything the day can bring you. We celebrate birthdays and babies being born because we honor life. We have each been given an identity from the Lord. It’s good to enjoy who He has made you to be and what He has called you to do. Have a good time being who you were created to be. value your life and the lives of those around you. Call out the greatness you see in people. Take joy in their victories and thank God for them. We have been invited and we are all in for the party of a lifetime. It’s time to rejoice in what the Lord has done for us! Let’s bring the joy and delight of heaven down to earth. God is good and His intentions for us are good. We get to join in with a good God to bring about His purposes to the world. If that’s not a reason to party I don’t know what is. Who are some people in your life you can value and honor? Does your life resemble a life of worship? What opportunities is God giving you to rejoice? What did resurrection mean to people in Jesus’ day, before he was resurrected himself? John 11 paints a helpful picture. The bulk of the chapter is the account of the death and resurrection of Jesus’ good friend Lazarus. It’s a fascinating tale. Jesus first delays in coming to Lazarus’ aid, suggesting, somewhat cryptically, that Lazarus will survive the illness (vv. 1-4). But once Jesus does arrive on the scene, his friend has already died and the whole matter becomes a crisis of faith for the witnesses. 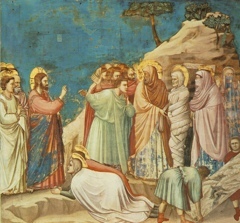 In the end, Lazarus emerges from the tomb smelling quite fresh and all appears well. Then the story makes an interesting shift, away from Jesus directly, to the broader context. Some of those who witnessed this resurrection felt compelled to report it to the Pharisees (v. 46). The Pharisees, in turn, call a council with the chief priests (v. 47). The conversation that John records says something remarkable about resurrection’s meaning among first century Jews. In verse 48, the situation is assessed. If Jesus continues doing what he’s doing, performing signs and wonders and whatnot, things will turn ugly for the Jews. These men at the top of Jewish society seemed to believe that if Jesus kept at it, then the Romans would soon bring trouble on the people, generally. Significantly, it’s the occurrence of a resurrection that prompts such a conversation. What does this mean? Why would a resurrection strike fear in the hearts of Jewish religious and political leaders? Why would the Romans see Jesus as a threat worth subduing? Two things I’ll say in answer. First, a word about what Jesus was shaping up to be. We can all agree that Jesus was regarded as a messianic figure. This is why the disciples were following him in the first place. Moreover, his choice of twelve disciples (twelve new tribes of Israel) points toward this role. The many signs and wonders he performed had people whispering, Could this be the messiah? The result was more and more people attaching themselves to his cause, or “believing in him.” By nature, a messiah of Israel is also a political figure, a king, in fact, along the lines of David. And anyone claiming to be a king (or even doing the things a potential king might do) is a natural threat to the incumbent ruler – in this case, Caesar. Second, resurrection is specifically a threat to any entrenched powers. This is less and less the case among today’s liberal governments, but the ultimate weapon that any political authority has over its subjects is the death penalty. Debate the effectiveness of the death penalty as a deterrence all you want, but if a king doesn’t like what you’re doing, he can very easily just kill you and all your followers. Problem solved. Indeed, the Romans were not bashful about such a tactic. But what if someone were roaming the kingdom raising the dead? What if someone were undoing the king’s edicts of capital punishment? Well, you can see how any ruler would have to restrict such a powerful person. If death and the threat of death is going to continue to exert control over the populace, one who resurrects the dead must be stopped. Each human journey is like a measuring stick or a time-line. Plotted along are milestones, marks of God’s goodness that we can point to. Some are major encounters while others seem like simple gestures of our Fathers love. I remember when my husband and I purchased our first home in the USA. Months before that the thought of purchasing a home was not even a consideration. Now it was our reality. The day we moved in was a day I will never forget, as I walked into one of the rooms I was overwhelmed with the presence and goodness of God, I knew that this home was a gift from Father God. There are many more milestones of His goodness on my time-line and on yours too. In between these climatic encounters and wonders from The Lord there’s the battlefield of life. Sometimes it’s easier to look at our lives as “the battlefield” rather than “the goodness of God.” That is not because the goodness of God is absent, but because we miss the God events. I could choose to have my life measured and marked with hardships, but I choose to have my life measured with what is true and forever; the goodness of God. Jesus taught us about the character of God. He said “He causes his sun to rise on the evil and the good, and sends rain on the righteous and the unrighteous” (Matthew 5:45). The goodness of God rains and shines over every creature, but we can easily miss Him. Sadly, the rain, the sunsets and other declarations of His glory are missed every day. Who are the righteous and the unrighteous that Jesus is referring to here? Are the righteous those who have done great deeds and the unrighteous criminals? Not according to God’s Word. It is clear that we do not make ourselves righteous–only Jesus blood can do that. So the righteous are the ones who have chosen Jesus, who have recognized that God is good and have received His salvation. The unrighteous are those who have missed God’s goodness and so remain in the condition that we all once lived in. The more we contemplate His goodness toward us, the more we see His goodness. “And we all, who with unveiled faces contemplate the Lord’s glory, are being transformed into his image with ever-increasing glory” (2 Corinthians 3:18). When we continually recognize God’s goodness we position ourselves to go from glory to glory we can’t help it because the more we see God’s goodness, (which is his glory) the more we start see from eyes that see his glory. We start to think with minds that understand His glory. We start to hear with ears that hear his glory. It is exponential! We can actually teach our own soul to recognize God’s goodness even in the smallest of things, and as we do this His peace, presence and joy will increase in our lives. This is a key for growth. When you see rain and sunshine on your life, on others and in the world remember it’s Him!